The establishment of SSPC’s five commercial coating committees marks a second major expansion of the scope of the Society. Founded in 1950, mainly through the efforts of the American Institute of Steel Construction (AISC), SSPC took as its scope the technology of cleaning and painting steel in industrial and public works environments. Indeed, until the mid 1980s, persons of prominence in the AISC chaired SSPC’s Executive Committee (an early version of its Board of Governors) and directed its research, education and standards-writing programs, all focused on steel substrates. In the late 1980s, however, with a new governance structure and a distribution of influence among all SSPC constituencies—raw materials, coatings, and equipment suppliers; contractors; and facility owners—SSPC was free to expand its scope to include the cleaning and painting of concrete in industrial and public works environments. So concrete bridges and tanks, secondary containment structures, floors in industrial plants, and wastewater transmission and treatment structures became a second part of SSPC’s technical focus. 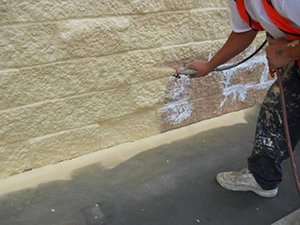 Cleaning and painting commercial building substrates has become the latest expansion of SSPC’s technical scope. The SSPC Commercial Coatings Committees (Architectural, Commercial, Institutional) are a group of committees formed in October 2011 to develop standards and guides associated with the cleaning and painting of commercial buildings. The mission of the committees is to develop independent, consensus-based standards on various types of coatings and related materials used in commercial and institutional applications. The committees’ scope of work also includes the development of guides related to surface preparation, coatings selection, and coatings application for the commercial, architectural, and institutional sectors. Inaugural meetings of the individual committees were held during the SSPC convention in February 2012 in Tampa, Fla. A great deal of progress has been made since 2012, as can be seen from the summaries below. The next in-person meetings of the committee will be held during the SSPC 2016 conference in San Antonio, Texas. It is interesting to note that these committees were formed around the same time that Durability+Design News began publishing. 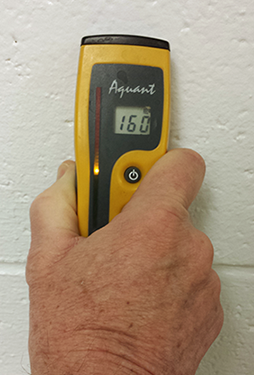 A radio frequency moisture meter can measure moisture in surfaces. Committee C.8.1, Commercial Cleaning and Painting, chaired by Kevin Brown of KTA-Tator, is nearing completion of both a new guide and a new standard to fill the voids that currently exist in the commercial painting industry. The guide, “Field Methods for the Determination of Moisture in Concrete and Masonry Walls and Ceilings,” is in its second ballot. The guide describes the use of a variety of instruments for detecting moisture in concrete, addresses the selection of moisture test locations, and provides recommended test frequencies. All comments were due the end of December and will be discussed at the January 2016 meeting. The committee expects the guide will be adopted by SSPC and published in 2016. A new standard, “Visual Evaluation of Pinholes in a Coated Surface,” is in development by a task group within C.8.1, chaired by Sam Scaturro, Alpine Painting & Sandblasting. The standard establishes procedures for determining the quantity of pinholes in coatings and provides acceptance criteria based on the classification of pinhole frequency. Once published, the standard will provide a uniform means to specify and determine compliance with limits for pinholes in commercial coatings. 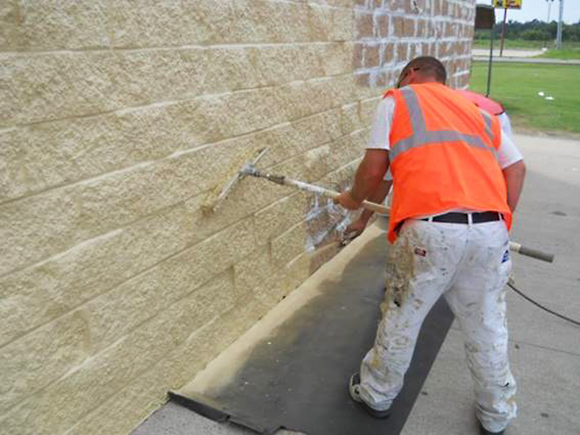 Future work includes the development of a guide that addresses equipment and techniques for cleaning masonry surfaces, including the pros and cons of each, and the development of standards that define various thresholds for the cleaning and roughening of masonry surfaces prior to painting. Committee C.8.2, Commercial Coating Materials, chaired by Steven Reinstadtler of Covestro, has published one paint material standard and is working on others. New work includes the development of similar standards for anti-graffiti coatings and fireproofing. Committee C.8.3, Commercial Floor Coatings, chaired by Fred Goodwin of BASF, has published a new guide and is working with the SSPC Concrete Surface Preparation Committee on the development of standards for the preparation of concrete. 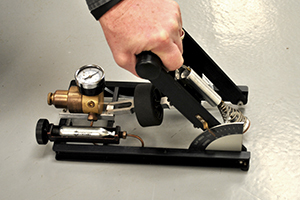 The tribometer is used to measure slip resistance of flooring. The scope of Guide 21, “Guide to Evaluation of Slip and Fall Resistance of Flooring Surfaces,” published in 2015, is outlined in its introduction: “This guide addresses issues regarding same-level falls due to the slip resistance of hard surface floors, including various methods for evaluation, test interpretation and maintenance protocols. According to the National Floor Safety Institute (NFSI), 55 percent of slips, trips, and falls are caused by a hazardous walkway. The purpose of this guide is to collect information on various standards for evaluating slip resistance into a single document that will assist owners in selecting a test method and evaluation criteria to specify (or evaluate) the degree of slip resistance required for a floor surfacing (or coating) in a given service environment. Thin film air barriers are applied just as paints. Committee C.8.4, Commercial Air and Vapor Barrier Coatings, chaired by Kevin Knight of Retro-Specs Ltd., has been developing a new standard for the laboratory testing of coating applied to CMUs to serve as an air barrier. Titled “Laboratory Performance Requirements for Coatings for Concrete Masonry Units in Air Barrier Assemblies,” the standard is nearing completion and is expected to be published in 2016. The standard contains criteria for the laboratory evaluation of the physical properties of coatings applied to CMUs used as air barrier assemblies in building enclosures. Future work includes the development of quality-assurance criteria for the installation of thin- film, liquid-applied air barriers on CMU and the development of a design guide for selecting thin-film coating systems. Committee C.8.5, Commercial Contractor Qualification, chaired by Jeff Theo of Vulcan Painters, revised SSPC-QP 9 for the qualification of coating contractors and is working on a body of knowledge for painter training, together with a standard for the qualification and certification of the painters. The applicator is shown back rolling to assure that irregularities of the masonry are filled. 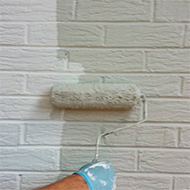 SSPC-QP 9, “Application of Architectural Paints/Coatings,” was revised by the committee in 2014. The standard addresses the requirements for contractors to become qualified to apply architectural coatings on commercial and institutional structures. The committee is also working on a standard for the training and certification of individual painters, “Architectural Coating and Application Specialist Qualification and Certification.” The proposed body of knowledge for the training is being developed.